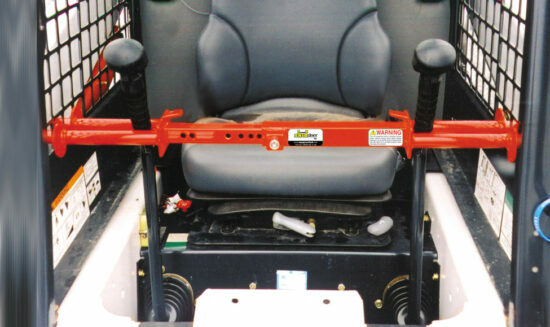 The Skidsteer Lock, when in place, makes it nearly impossible to gain access to the skid steer loader operator’s seat. 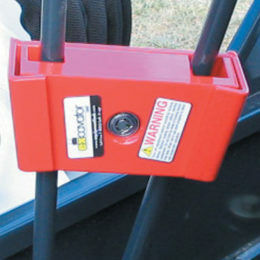 Immobilizing the drive controls prevents theft, vandalism and joyrides. It also eliminates other trades from borrowing the machine even if the ignition key is available. The Skidsteer Lock neatly collapses and stores in the locked position inside the operator’s cab – completely out of the way. Before you purchase, please note: Some models of Gehl®, Mustang®, ASV®/Terex® and all of Belle® skid loaders may not have holes in the protective cage below the drive controls. Additionally, Caterpillar® skid loaders with enclosed cabs (ONLY) may have stationary glass or a square steel plate for directions at drive control level. John Deere® skid loaders with enclosed cabs (ONLY) may have a door that tilts inward. These circumstances may prohibit the Skidsteer Lock or E-Series Skidsteer Lock from being installed in the normal fashion. JCB Robot®, Kubota®, Takeuchi® and Thomas® skid loaders cannot use the Skidsteer Lock, only the E-Series Skidsteer Lock may be used. Please contact TELC for alternative installation instructions prior to ordering for any of the above-mentioned machines. Both products DO work on “joystick” type controls and typical enclosed cabs. Will it work on an enclosed cab? Thank you for your interest in The Equipment Lock Company products. Your question for the enclosed cab application is common. YES, it will work! 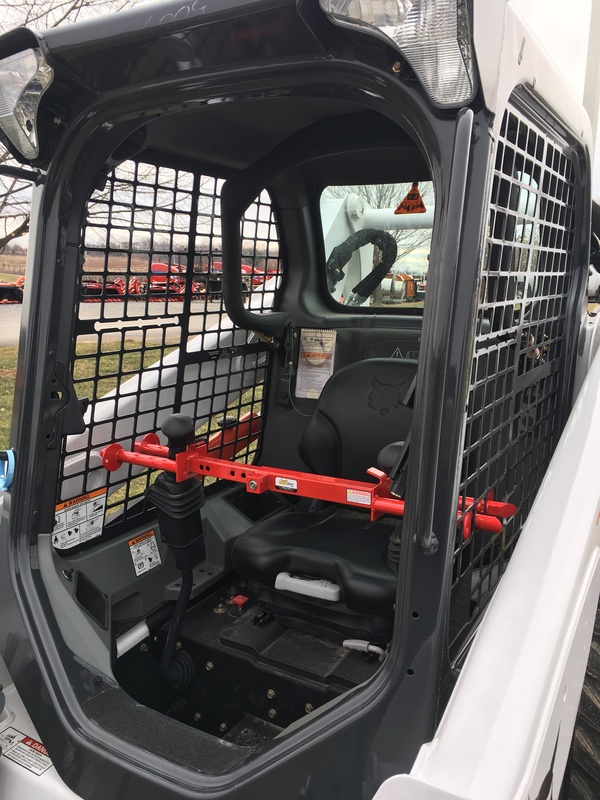 The Skid Steer Lock, which locks both drive controls, is installed by sliding both windows back.It then captures both drive controls as it extends thru the cage holes on both sides securing tightly against the cage. While the machine is locked, both windows remain open. See NOTE below. 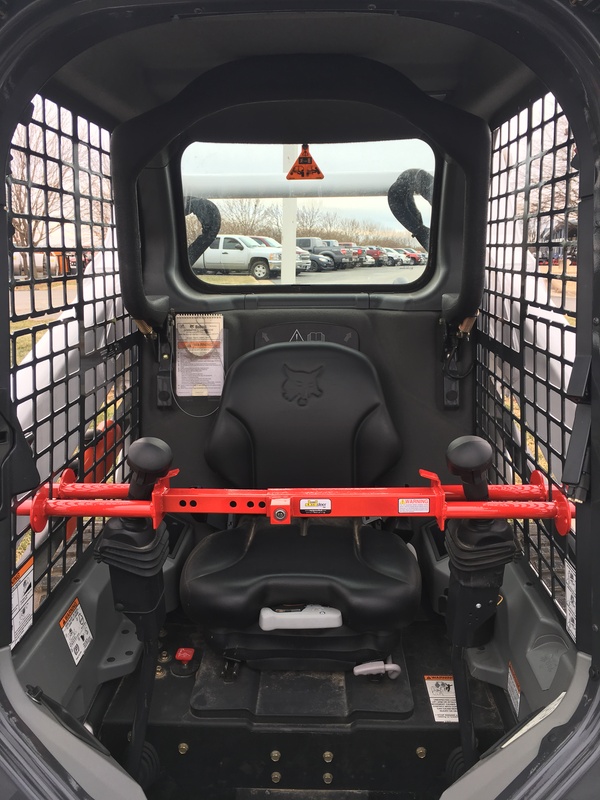 The E-Series Lock, which locks one drive control lever, mounts permanently on the cage by \”sandwiching” two plates on the cage. 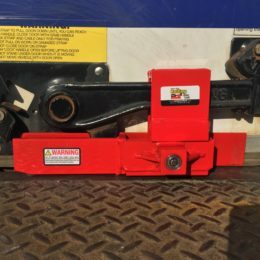 In the case of enclosed cabs, the locking plate is installed on the outside of the cab and the 3/16\” thick mounting plate is put on the inside (this allows the glass to slide past it while operating the machine). A window must be open only while the lock is installed. See NOTE below. The E-Series Lock is permanently attached with 4 non-reversing stainless steel screws. 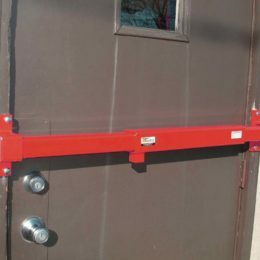 The \”U-bar\” captures one drive control lever and locks into the locking plate (which is secured on the cage) therefore securing the machine. NOTE: Some of our Canadian customers have cut a piece of Plexiglas or plywood to fit over the exposed window area while the machine is being secured, therefore preventing the weather from coming in. 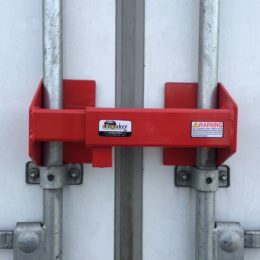 Others have mounted the E-Series lock below the cab window by drilling 4 small holes for the mounting screws, therefore allowing normal window usage. We cannot, and do not recommend this installation due to liability and warranty reasons with your machine. The installation we were told of requires an area directly below the window, in-line with the drive control lever, on the solid steel portion of the protective cage 4\” high and 6\” “length-wise” (preferred on the left side as if seated). All installation remains the same, but holes must be drilled in the protective cage (ROPS) for the 4 screws. We do not, and cannot recommend this installation method due to liability and warranty reasons with your machine. Again, we do not, and cannot recommend this installation method due to liability and warranty reasons with your machine. Should you drill holes in the protective cage (ROPS) it may affect the structural integrity (warranty), and cause damage or injury. Should you become injured from this occurrence, TELC cannot be held responsible (liability) for your installing the product in this method. Again, we do not, and cannot recommend this installation method due to liability and warranty reasons with your machine. This is why we recommend installing The E-Series Lock on the outside of the cage and leaving the window open while the lock is securing the machine. SPECIAL NOTE: Some models of Gehl® and all of Belle® skid loaders may not have holes in the protective cage below the drive controls. Additionally, some models of Caterpillar® skid loaders with enclosed cabs (ONLY) may have stationary glass at drive control level. 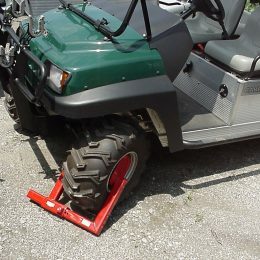 This may prohibit the Skidsteer Lock or E-Series Skidsteer Lock from being installed in the normal fashion. JCB Robot®, Takeuchi® and Thomas® skid loaders cannot use the Skidsteer Lock, only the E-Series Skidsteer Lock may be used. 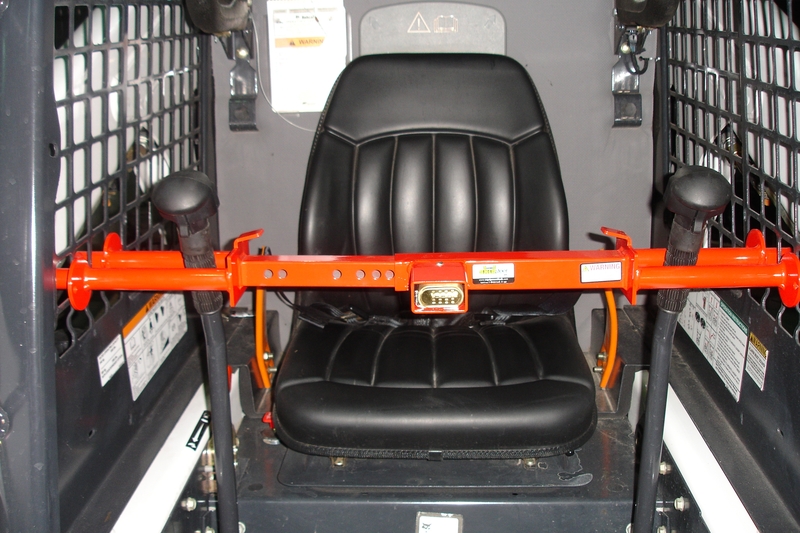 The Skidsteer Lock or E-Series Skidsteer Lock may be installed in a manner to prevent the lap-bar from coming down prohibiting operation. Please contact TELC for alternative installation instructions prior to ordering for these machines. Should you have any further question, please don’t hesitate to contact us. The Equipment Lock Company, LLC.